By way of acknowledgement, the model I use for this paper was given to me by my MBA lecturer – the late Michael Halliday. I found it at the back of a reading he asked us to look at. The reading went on to say “Shareholder value creation can be defined as the process of building lasting economic value for a corporation’s shareholders and key stakeholders such as the employees, customers, suppliers, financiers and society. The problem is that the objectives of the shareholders and stakeholders are often different and most likely in conflict with each other. These differences stem from the fact that while managers face the daily challenge of maximising sales, profit and market share, third party institutions generally own the majority of shares. This creates a separation of ownership and control. Theory has it that managers are the agents of the owners and in a perfect world the share price would reflect the present value of all future activities the company and good management practice would drive up the share price. In reality, institutions are judged on the short term performance of their portfolios and they therefore pressure management to deliver high increases in the short term. This in turn causes business managers to adopt inappropriate management practices at the expense of the mid to long term”. Michael Halliday. The above quote refers to public companies. I believe it is equally true for private companies. The difference is that in private companies the owner is the manager and as such time pressures (quarterly reporting) are reduced and there is less scrutiny on his / her behaviour and decision making. But in practice, the end game for both types of company is the same – namely value creation. There are four primary drivers of organisational value: Profitability, Productivity, Cash flow and Strategic Growth. These four drivers are of equal importance and it is difficult to pick a start point. You need cash, otherwise you can’t start, but you also need a market and a business otherwise you can’t apply your cash. You may have identified your market, but if you don’t have a sales proposition, then you won’t sell and you won’t place demand on your assets (productivity). I will start with Growth. Growth represents the markets that you trade in or plan to enter. Ansoff articulated it well with his grid. This paper is going to focus on differentiation only. This is improving returns from an existing market. Differentiation is easier of the two strategies as the market knows who you are and is preconditioned to trust your products. With differentiation the manager has two choices at their disposal. Compete through better product positioning. Degree of differentiation. The more a product is positioned and perceived as exclusive or tailor made, the more the market will pay for it. A product positioned as Tailor Made is developed for a specific individual according to their specific needs. This by its nature is highly differentiated and very expensive. Traditionally you can’t have both and these two axes work inversely to each other. The more you differentiate, the more it costs. To differentiate your product in an existing market requires that you know how it is positioned relative to the rest of the market. Consider the following example market plot. 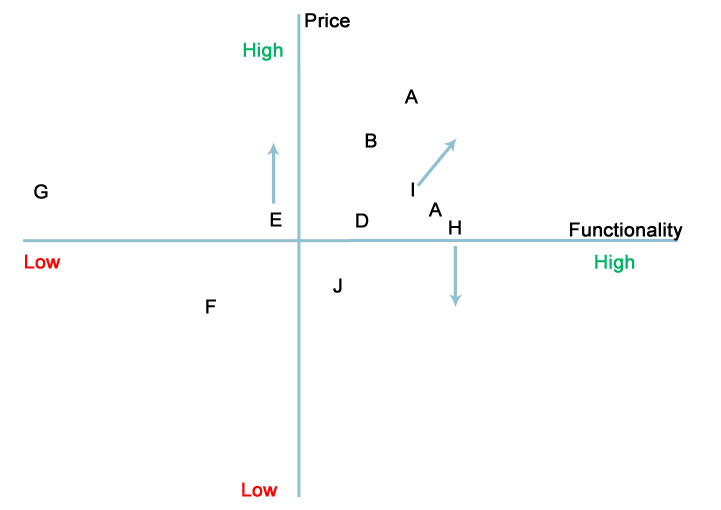 The X axis is Functionality and the Y axis is Price. Both axes are rated high/low. The plots represent the product positioning in the market. There are some great toolsets in the market to assist with this type of analysis. The plot identifies open areas, where there are few or no products. 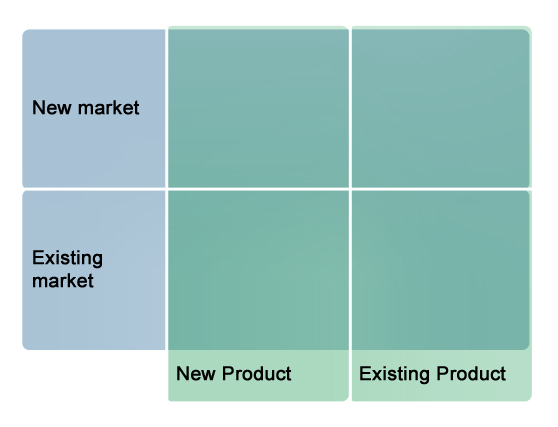 These areas represent the opportunity to either reposition your existing product or launch a new product to fill the void. The risk is that existing products (including your own) have an existing position in the market and customers understand this. If the distance from the current position to the new position is too great, the customer will become confused and it is likely you will lose sales. For ‘bigger distances’ it is better to launch a new product that is clearly different from the existing products. The need for, and nature of, the sales support makes a huge difference to profitability. A product that requires face to face sales support requires a higher margin. When introducing a new product, this type of support should be considered. If the new product is a premium product, then the cost of hiring and training specialist sales staff should be considered. Or, if the strategy is to reposition an existing product as more exclusive, then the existing sales staff may not be of the right profile to sell/represent the new position. The strategy of the ‘profitability leg’ is to create a balance between margin and volume. Volume equals demand for the product. In many respects, volume is the most important variable in the business. You can have great people, outstanding marketing, top products, but if you don’t sell anything you don’t have a business. You also need an appropriate return for the product or service. If the margin is high, then the volume can be low. This is perfectly acceptable in a business designed for low volumes. But in many cases a high margin is not enough. Volume must be high as well. Consider a $1 product that produces an 80% margin. Good margin, but no money. Volume is the primary driver for the ‘productivity leg’. To compete on cost requires a focus Asset Productivity. A key measure is Return on Capital Employed. These four assets are the tangible side of the business. Improving the yield (productivity) from these assets will grow the value of the business. The inputs are the assets. The output is the product or service that the customer buys. Earlier in the article I noted the need to create demand for the business and that the ‘legs’ of growth and profitability create demand. In this case, demand means – demand for the output of the business. The managers job is to maintain and grow this demand and to work the assets to maintain a target productivity ratio. Unfortunately most managers only have control over the assets and not the market place. By market place I mean the sales and marketing initiatives of the company. This means that most managers have little control over the creation of demand for the assets in their managerial portfolio and the only lever they can pull (especially when times are tough) is option 3 – the cost reduction lever – decreased asset input. This is often results in layoffs as the human asset is the easiest one to move and is the asset that delivers immediate cost reductions. 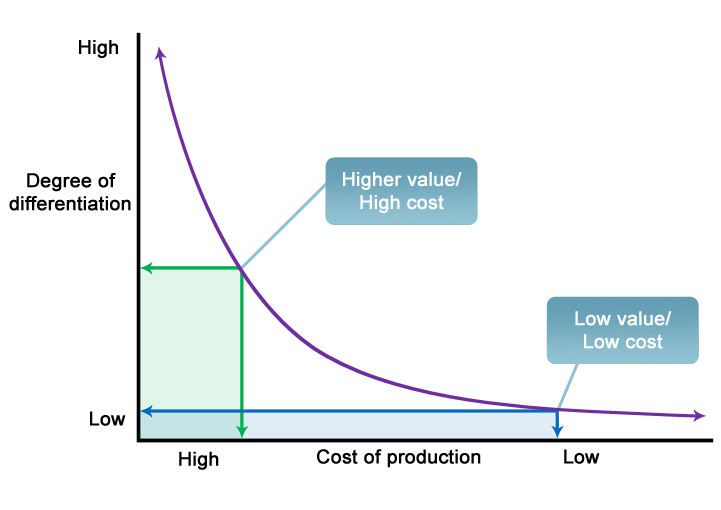 But if the business wants to lower the cost of production whilst maintaining is point of differentiation then I recommend a model I picked up from IBM called the dynamic stability model. The way it works is to separate marketing from production. Prevailing wisdom says that these concepts are closely aligned. ‘Tailor Made’ requires ‘Invention’ and ‘Commodity’ requires ‘Mass production’. The strategy is to break the connection between the two concepts. 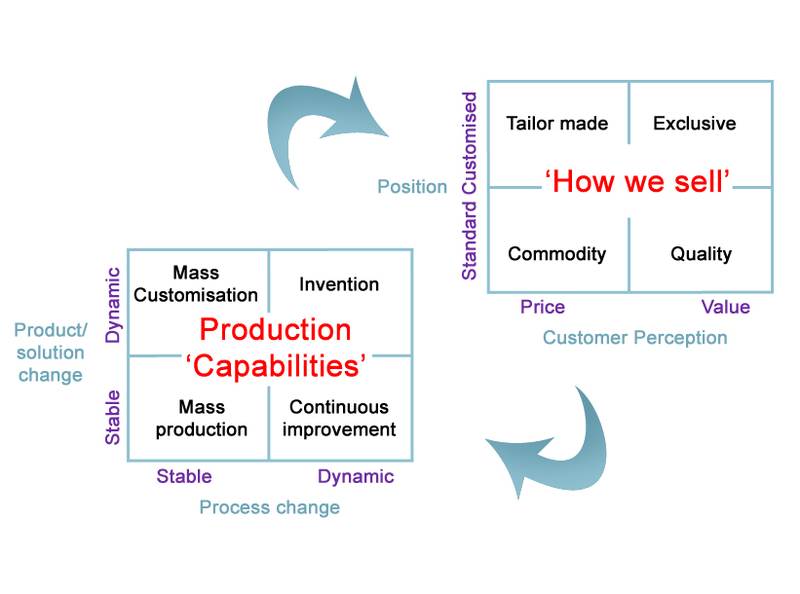 In the extreme this means that you setup a mass production environment for a Tailor Made product. 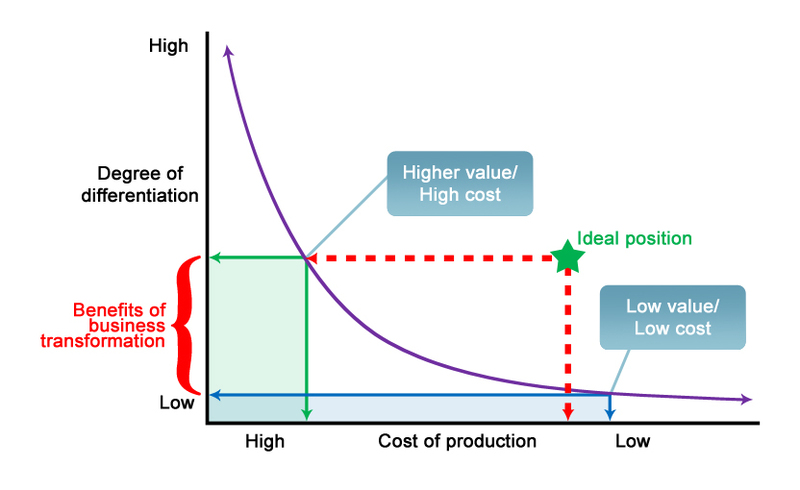 Mass production reduces the cost of the producing the product. Tailor Made maximises the value of the item. The difference is a maximisation of the gross margin of the product. If you can keep a mass production environment working the assets have little to no downtime and productivity ratio will be high. Stakeholder value is created when a business is able to lower the cost of production without compromising the point of differentiation. This is the ideal position and it represents the point at which the company can charge a premium price and take an inflated gross margin. It is vital to understand the assumptions behind the venture before making the financing decision. It is common for entrepreneurs, managers and business analysts to build an investment spreadsheet and consider to that it reflects what will happen in real life. It is important to not only validate the written assumptions, but equally or more important, to validate assumptions that are not there. What has the author missed? What’s not written down? If you have an existing business then the model should focus on the planned extension to the business. In other words could the extension stand on its own merits? If it cannot, you could be growing revenue but diluting gross margin. If it can, what synergies will you pick up by merging the new with the existing business? The answer is really the least of your worries. Do not anticipate it, do not rush it. A rushed model will provide the answers you want rather than the answer you need. Once you have the answer you are now in a position to determine your source of funds. I acknowledge the model will need to include funding options in order to take into account interest expense. But you should model with a ‘switch’ to turn this option on or off. If the model indicates stable growth and there is confidence in the assumptions, then debt is probably the way to go. If it appears that the venture will require a ‘long runway’ to get off the ground then equity may make more sense, depending whether or not you can fund the interest payments on debt. My experience is that things always take longer to materialise than expected and if you go the debt option, allow yourself a good cushion of time. It must be said that equity is the most expensive form of money. Not in terms of dividends etc, but when it comes to selling the asset. What at that time, what seems like a reasonable equity percentage at the start could become a very big payout number at the end. A good equity partner should assist the business and help it grow. Often investors have great management skills and can bring a lot to the business. Choose a financing methodology that will support your business through the difficult first years but will not be too expensive when it comes time to exit.